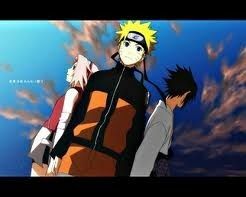 You are going to Watch Naruto Shippuden Episode 283 English subbed online free episodes with HQ / high quality. Stream Anime Naruto Shippuden Episode 283 Online English sub Two Suns. As he and A exchange blows, Killer Bee lament to A out he is overprotecting him after reminding his foster brother that he urged him to develop his Tail Beast when he became Raikage after his father’s death. A explains that both Bee and Naruto, as Jinchuriki, are extremely valuable and intends to keep them save even if it is against their will. But Bee’s determination allowed him to make a connecting Lariat on A, comparing his mindset to a sun and Naruto’s own determination to two suns, referring to his parents Minato and Kushina. While Tsunade allows Naruto to enter the war, an unconvinced A makes a final move to take the boy out at lightning speed.